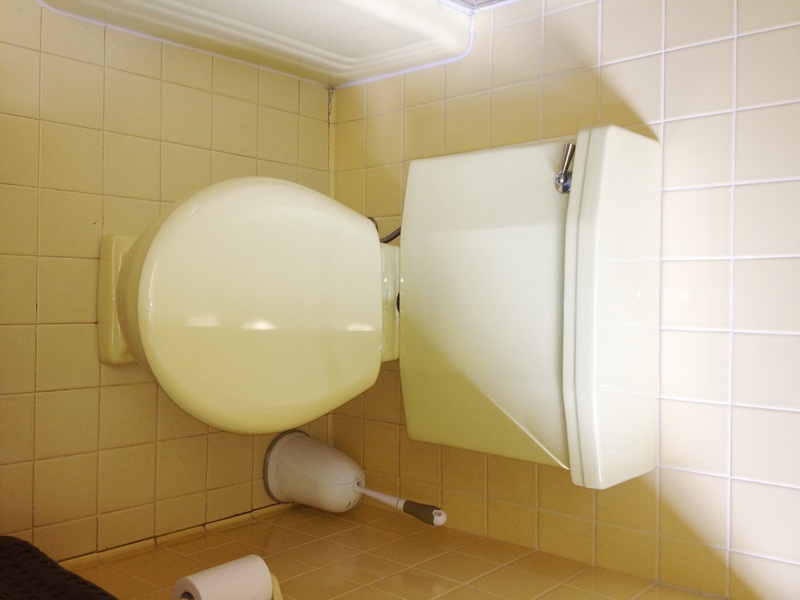 There’s no hiding it, the two primary bathrooms in our home are colorful–one yellow and one blue. 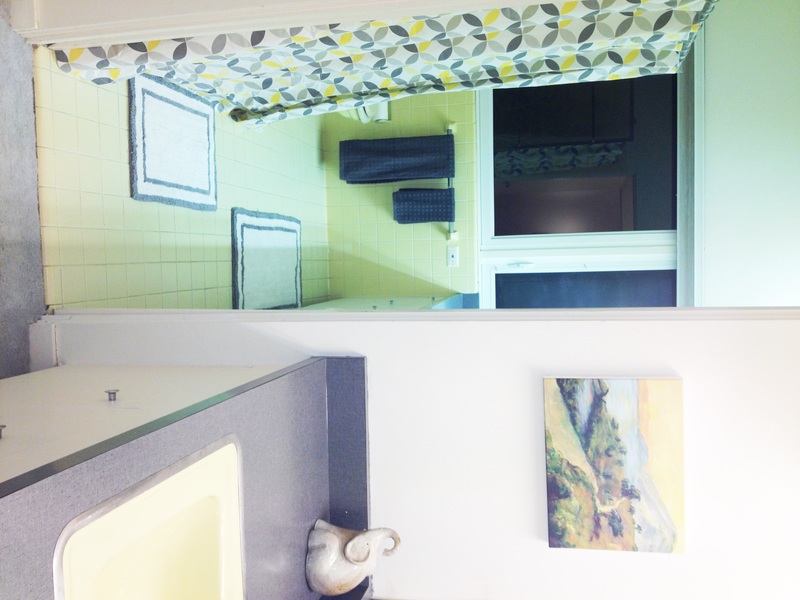 Both baths are technically comprised of two rooms–which I will get into in a moment–but because of this odd arrangement the spaces are incredibly difficult to capture on camera. Bear with me, I’ve done my best. This bathroom has a washroom up front with a sink across from a large closet and a pocket door that separates it from the tub/sink/toilet area. What you can’t see in the above photo are the nine yellow floor tiles that are missing in front of the far sink (see how the previous owners casually hid them under that carpet remnant? Yeah, about that…). We were none too pleased to find the big concrete filled hole underneath when I trashed that gray carpet scrap, but I managed to hide it with a strategically placed bath mat. Two points for me. Not so bad right?! I actually really like it now. For about $40 at HomeGoods I got new towels, a shower curtain and the two bathmats and I’m really happy with how they coordinate with the existing fixtures. It’s just a stroke of luck that yellow and grey is all the rage these days. Everything comes back in style again eventually right? See the ratty gray carpet in the foreground of the above pic? 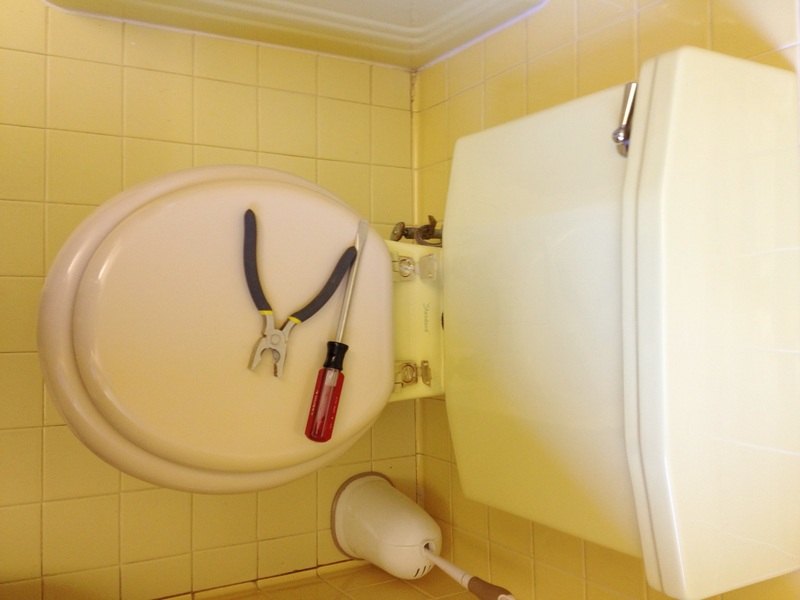 Apparently there was a plumbing issue at some time and all the original yellow tile was pulled up in the washroom leading into the bathroom and partially removed in front of the second sink. Instead of replacing the flooring, the previous owners just laid a scrap of carpet down over the concrete floor and called it a day. Perhaps the fact that they didn’t even bother to properly install the carpet is a blessing in disguise as I’m in no mind to revisit the task of carpet demo again just yet. 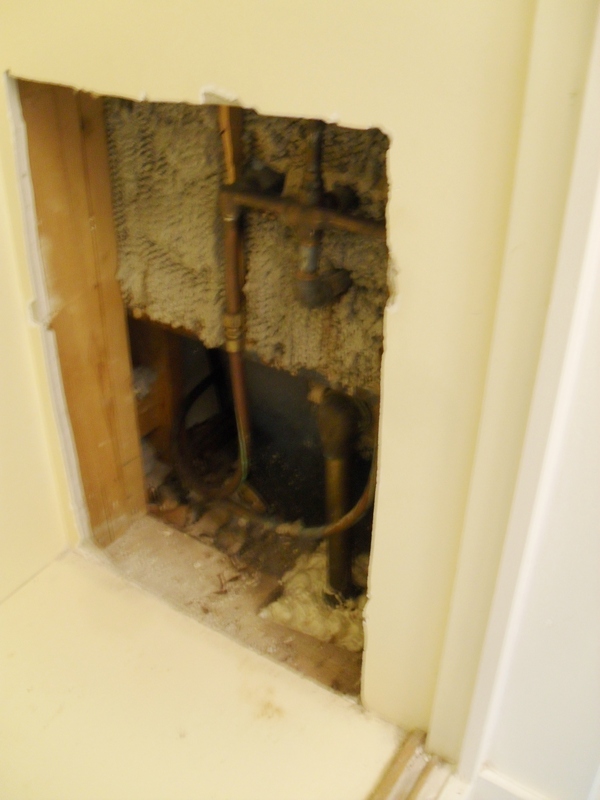 Side note: there is also a HUGE hole in the drywall behind the tub–which luckily is in the closet. We plan to install an access panel over it at some point, but for now we’ve just tossed some storage tubs in front keep the little one safe. He can’t open the sliding closet doors yet, so we have some time. But back to the floor, we definitely want to get rid of that old carpet ASAP, but we aren’t ready to completely redo the bathroom just yet. We thought of having the flooring installers carry the bamboo into the washroom, but there were moisture concerns. Wood floor + sink = no bueno. So we went on the hunt for replacement tiles. Turns out (no surprise here) that yellow tiles are pretty hard to find! We checked out Habitat for Humanity of the Chesapeake ReStore and Second Chance both in Baltimore, but came up short. On to the interweb! We’ll keep you posted. 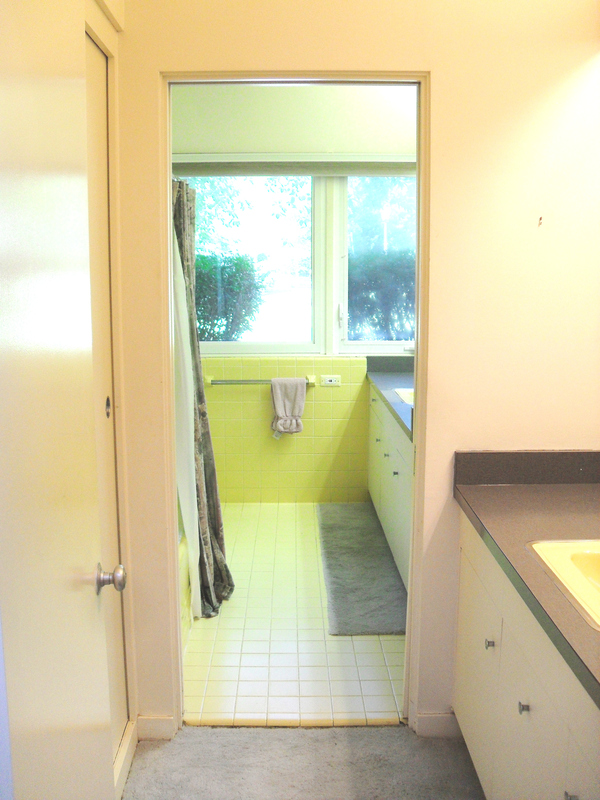 In sharp contrast to our happy yellow bath is our sad, sad master bath–a true sight for sore eyes. 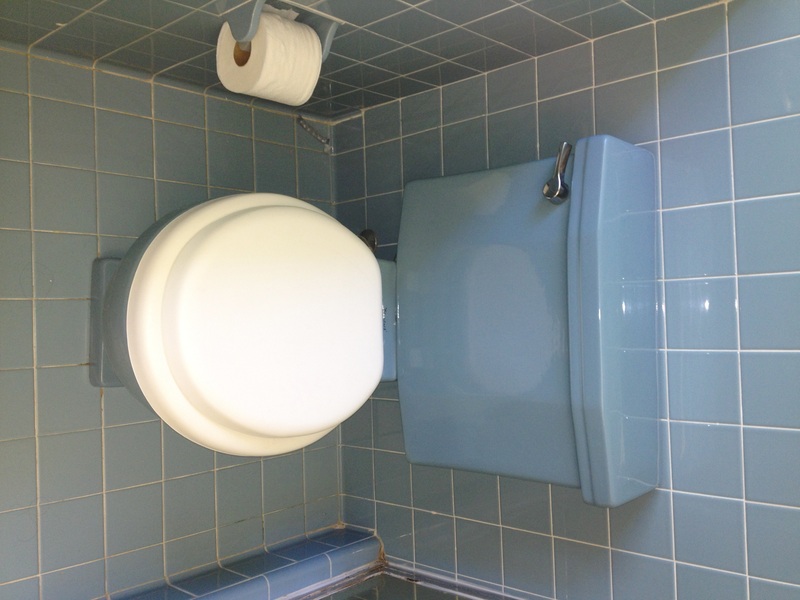 He’s got blue tile floors, blue tile walls, a blue tile shower, and a blue toilet. All that dusky blue paired with the endless mirrors really make the space feel closed-in and claustrophobic. This room is like the depressed counterpart of its sun-shiny sister across the hall. As it looked on Move-in Day. We have a lot to do in here to help perk this space up, but we’ll be starting by installing new blinds as we quickly discovered the old ones don’t close. Ever bathed in a glass-walled shower in front of an uncovered picture window? It’s like high school gym all over again. Maybe one day we can afford a total gut on this room, but not now. To make this room a little easier to live with we have some grouting, caulking, and painting planned along with new counters, a new sink, spruced up drawer hardware, the removal of two grab bars, and the dismantling of one toddler-magnet space heater (I didn’t even know what that big while box was until Logan turned the dial and blasted me with hot air). 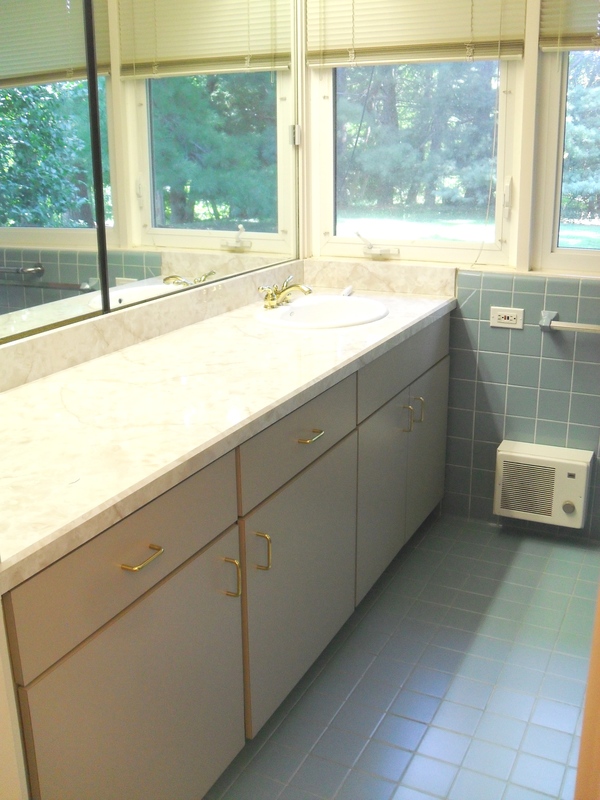 A 50s bathroom + an 80s vanity = One Hot Mess. 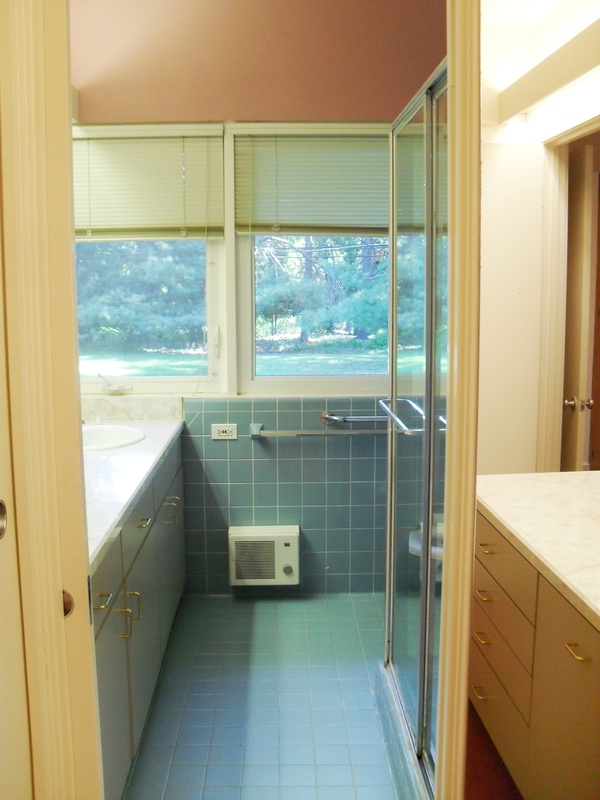 What you can’t really see in the before photos are the toilets. The yellow one had a broken baby pink lid/seat combo and the blue one had a cushy geriatric seat that made me feel 98 years old every time I sat on it. 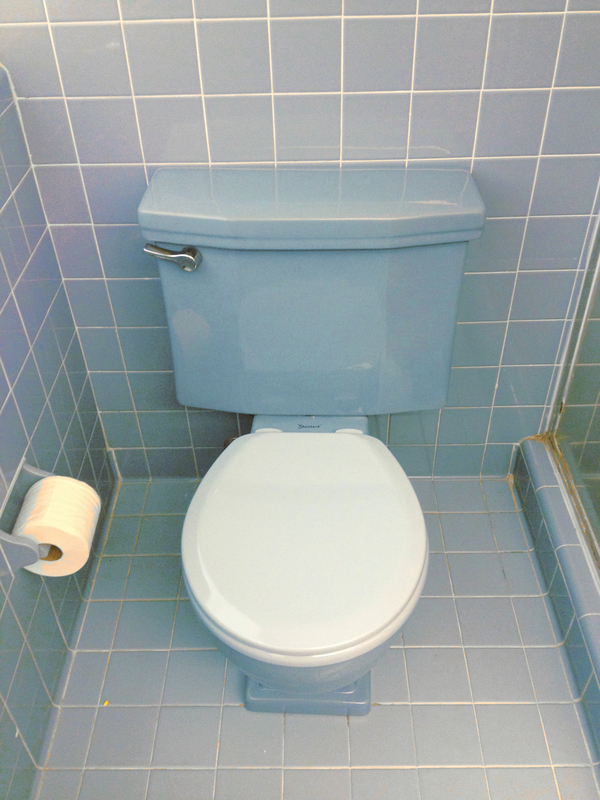 Oh yes, we did indeed buy a yellow and a blue toilet seat. 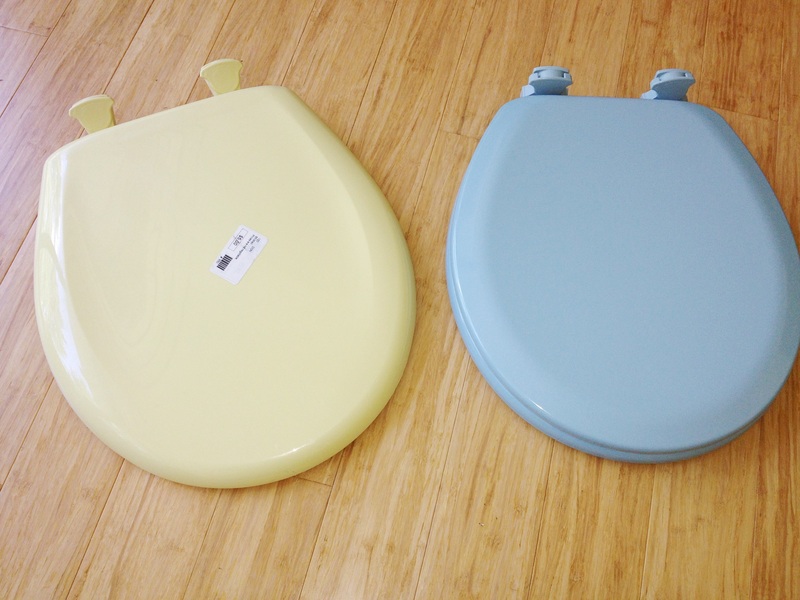 The yellow one was only $5 at Habitat for Humanity (new with tags) and the blue one was also found new from Home Depot of all places (they still sell blue toilet seats?!). The yellow seat ended up being a perfect match, although the blue one a little light. For some reason this photo makes it look VERY light, but in person the color difference is not that noticeable. My 31 year old tuchus appreciates its rigidity and, really, that’s all that matters.